Men carve meaning into women’s faces; messages addressed to other men. In Achilles’ compound, the message had been: Look at her. My prize awarded by the army, proof that I am what I’ve always claimed to be: the greatest of the Greeks. Pat Barker’s book The Silence of the Girls is one of a wave of novels giving a “herstory” angle on the Greek epic: from Margaret Atwood’s Penelopiad to Emily Hauser’s For the Most Beautiful and Madeline Miller’s Circe, there is no shortage of female perspectives on the Homeric poems. Combine this with Caroline Alexander’s translation of the Iliad and Emily Wilson’s of the Odyssey, each the first English translation of their poem written by a woman, and we have a real feminist revolution in our mainstream engagement with Homer. The tables have well and truly turned. But what fascinates me is that the radical change is in the reception of Homeric epic, not Homeric epic itself. The poetry hasn’t changed—only the way we look at it. It’s not Homer’s fault that his poetry is rarely translated by women. It’s not Homer’s fault that Classics has historically been a male-dominated province. It’s not Homer’s fault that groups like the Women’s Classical Caucus still have a long road ahead of them. Books like The Silence of the Girls give voice to women constrained by a patriarchal society and a masculine epic idiom of action. But are they really “revisionist” readings? Or are they, rather, bringing out something that is already there in the Homeric poems? It seems to me that the ostensible masculinity of the Iliad belies a sensitivity to the female viewpoint, and this is further developed in the Odyssey. Homer is not uninterested in his female characters—we just need the right tools to see it. They prove so compelling because we want to hear these “alternative” stories, stories the classical tradition has suppressed for so long. Because there is a critical mass of people listening for the woman’s voice. Women become objects which exist for the purpose of, or find their identity in, exchange. And yet, as Deborah Lyons writes in her 2012 Dangerous Gifts: ’As much as men may define women as exchange objects, there is always the possibility that women will find a way to express their own agency.” In the Iliad 19 passage, the women are prized for their ‘work’, which in Homeric epic implies more often than not the production of woven objects. And restricted to their domestic sphere, they are left to their own devices in a domain in which objects proliferate. Homeric women use such objects to negotiate their agency: a subversion of the male viewpoint, as women enact their agency through the very form they themselves are thought by their men to embody. So telling the story from the perspective of a female character, who is key to the narrative but relatively minor in her Homeric setting, is one way to give voice to the women of Greek epics. Another option is to consider these women in another way—through the objects they use to negotiate their agency, to express themselves, and to contribute to the action. Sadie Plant in her 1997 book Zeroes + Ones traces female involvement in technology from Ada Lovelace and her thinking machines to the Bomb Girls and the woman at the telephone switchboard. She sees the development of technology as one continuous process whose common denominator is weaving: “The yarn is neither metaphorical nor literal, but quite simply material, a gathering of threads which twist and turn through the history of computing, technology, the sciences and arts.“ Plant writes: “They ’signal to each other‘, whispering in their own strange codes, ciphers beyond his linguistic powers, traveling on grapevines which sidestep centralised modes of communication with their own lateral connections and informal channels.” Similarly, Jean Baudrillard in Cool Memories: “They are all involved together in secret discussions. Women weave amongst themselves a collusive web of seduction.” These threads can be traced back to before the Jacquard loom, before wires and software—to objects in Homeric epic. These informal channels and secret discussions are already embedded in archaic Greek poetry. Luce Irigaray expresses the concern: “what if these ’commodities’ refused to go to market? What if they maintained ’another’ kind of commerce, among themselves?” Through objects, Homer’s supposedly ‘commodified’ female characters create their own kind of commerce, and their own channels of communication. Barker’s Briseis tells us that “Men carve meaning into women’s faces; messages addressed to other men”—but there are just as many messages exchanged between women. And what is even more interesting is that, whilst Briseis can interpret the men’s messages, in the Homeric poems it is often the case that the female communicative code cannot be interpreted by the men. These really are secret discussions. Homeric women are not only objectified but are also well-versed users of objects. This is something that Homer portrays clearly, that Odysseus understands—but that has often escaped many other men, from Odysseus’ alter ego Aethon in Odyssey 19 to modern experts on Homeric epic. The time is definitely ripe for the feminist wave to make something of this. Featured Image Credit: Greek Ruin by Luca Nicoletti. Public Domain via Unsplash. 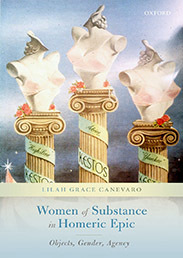 Lilah Grace Canevaro is Lecturer in Greek at the University of Edinburgh. She has been a Leverhulme Fellow in Edinburgh and a Humboldt Fellow in Heidelberg, and gained her PhD at Durham University in 2012. She is the author of Hesiod's Works and Days: How to Teach Self-Sufficiency, and co-editor of Conflict and Consensus in Early Greek Hexameter Poetry. This is from Oxford University of all places, and there’s a mistake writing Achilles’s name corecttly in the possessive!